Welfare economics is a branch of economics that uses microeconomic techniques to evaluate well-being (welfare) at the aggregate (economy-wide) level. A typical methodology begins with the derivation (or assumption) of a social welfare function, which can then be used to rank economically feasible allocations of resources in terms of the social welfare they entail. Such functions typically include measures of economic efficiency and equity, though more recent attempts to quantify social welfare have included a broader range of measures including economic freedom (as in the capability approach). The field of welfare economics is associated with two fundamental theorems. The first states that given certain assumptions, competitive markets produce (Pareto) efficient outcomes; it captures the logic of Adam Smith's invisible hand. The second states that given further restrictions, any Pareto efficient outcome can be supported as a competitive market equilibrium. Thus a social planner could use a social welfare function to pick the most equitable efficient outcome, then use lump sum transfers followed by competitive trade to bring it about. Because of welfare economics' close ties to social choice theory, Arrow's impossibility theorem is sometimes listed as a third fundamental theorem. Attempting to apply the principles of welfare economics gives rise to the field of public economics, the study of how government might intervene to improve social welfare. Welfare economics also provides the theoretical foundations for particular instruments of public economics, including cost–benefit analysis, while the combination of welfare economics and insights from behavioural economics has led to the creation of a new subfield, behavioural welfare economics. Utility is cardinal, that is, scale-measurable by observation or judgment. Preferences are exogenously given and stable. Additional consumption provides smaller and smaller increases in utility (diminishing marginal utility). All individuals have interpersonally commensurable utility functions (an assumption that Edgeworth avoided in his Mathematical Psychics). With these assumptions, it is possible to construct a social welfare function simply by summing all the individual utility functions. Note that such a measure would still be concerned with the distribution of income (distributive efficiency) but not the distribution of final utilities. In normative terms, such authors were writing in the Benthamite tradition. The New Welfare Economics approach is based on the work of Pareto, Hicks, and Kaldor. It explicitly recognizes the differences between the efficiency aspect of the discipline and the distribution aspect and treats them differently. Questions of efficiency are assessed with criteria such as Pareto efficiency and the Kaldor-Hicks compensation tests, while questions of income distribution are covered in social welfare function specification. Further, efficiency dispenses with cardinal measures of utility, replacing it with ordinal utility, which merely ranks commodity bundles (with an indifference-curve map, for example). Situations are considered to have distributive efficiency when goods are distributed to the people who can gain the most utility from them. Many economists use Pareto efficiency as their efficiency goal. According to this measure of social welfare, a situation is optimal only if no individuals can be made better off without making someone else worse off. The marginal rates of substitution in consumption are identical for all consumers. This occurs when no consumer can be made better off without making others worse off. The marginal rate of transformation in production is identical for all products. This occurs when it is impossible to increase the production of any good without reducing the production of other goods. The marginal resource cost is equal to the marginal revenue product for all production processes. This takes place when marginal physical product of a factor must be the same for all firms producing a good. The marginal rates of substitution in consumption are equal to the marginal rates of transformation in production, such as where production processes must match consumer wants. Imperfect market structures, such as a monopoly, monopsony, oligopoly, oligopsony, and monopolistic competition. Factor allocation inefficiencies in production theory basics. Market failures and externalities; there is also social cost. Price discrimination and price skimming. Long run declining average costs in a natural monopoly. Certain types of taxes and tariffs. To determine whether an activity is moving the economy towards Pareto efficiency, two compensation tests have been developed. Any change usually makes some people better off while making others worse off, so these tests ask what would happen if the winners were to compensate the losers. Using the Kaldor criterion, an activity will contribute to Pareto optimality if the maximum amount the gainers are prepared to pay is greater than the minimum amount that the losers are prepared to accept. Under the Hicks criterion, an activity will contribute to Pareto optimality if the maximum amount the losers are prepared to offer to the gainers in order to prevent the change is less than the minimum amount the gainers are prepared to accept as a bribe to forgo the change. The Hicks compensation test is from the losers' point of view, while the Kaldor compensation test is from the gainers' point of view. If both conditions are satisfied, both gainers and losers will agree that the proposed activity will move the economy toward Pareto optimality. This is referred to as Kaldor–Hicks efficiency or the Scitovsky criterion. There are many combinations of consumer utility, production mixes, and factor input combinations consistent with efficiency. In fact, there are an infinity of consumption and production equilibria that yield Pareto optimal results. There are as many optima as there are points on the aggregate production–possibility frontier. Hence, Pareto efficiency is a necessary, but not a sufficient condition for social welfare. Each Pareto optimum corresponds to a different income distribution in the economy. Some may involve great inequalities of income. So how do we decide which Pareto optimum is most desirable? This decision is made, either tacitly or overtly, when we specify the social welfare function. This function embodies value judgements about interpersonal utility. The social welfare function shows the relative importance of the individuals that comprise society. A utilitarian welfare function (also called a Benthamite welfare function) sums the utility of each individual in order to obtain society's overall welfare. All people are treated the same, regardless of their initial level of utility. One extra unit of utility for a starving person is not seen to be of any greater value than an extra unit of utility for a millionaire. At the other extreme is the Max-Min, or Rawlsian utility function (Stiglitz, 2000, p102)[incomplete reference]. According to the Max-Min criterion, welfare is maximized when the utility of those society members that have the least is the greatest. No economic activity will increase social welfare unless it improves the position of the society member that is the worst off. Most economists specify social welfare functions that are intermediate between these two extremes. The social welfare function is typically translated into social indifference curves so that they can be used in the same graphic space as the other functions that they interact with. A utilitarian social indifference curve is linear and downward sloping to the right. The Max-Min social indifference curve takes the shape of two straight lines joined so as they form a 90-degree angle. 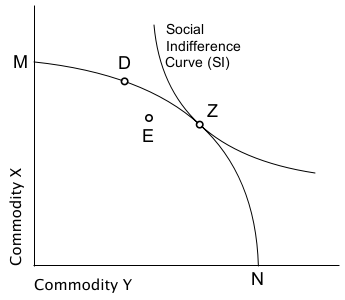 A social indifference curve drawn from an intermediate social welfare function is a curve that slopes downward to the right. The intermediate form of social indifference curve can be interpreted as showing that as inequality increases, a larger improvement in the utility of relatively rich individuals is needed to compensate for the loss in utility of relatively poor individuals. A crude social welfare function can be constructed by measuring the subjective dollar value of goods and services distributed to participants in the economy (see also consumer surplus). The field of welfare economics is associated with two fundamental theorems. The first states that given certain assumptions, competitive markets (price equilibria with transfers, e.g. Walrasian equilibria) produce Pareto efficient outcomes. The assumptions required are generally characterised as "very weak". More specifically, the existence of competitive equilibrium implies both price-taking behaviour and complete markets, but the only additional assumption is the local non-satiation of agents' preferences – that consumers would like, at the margin, to have slightly more of any given good. The first fundamental theorem is said to capture the logic of Adam Smith's invisible hand, though in general there is no reason to suppose that the "best" Pareto efficient point (of which there are a set) will be selected by the market without intervention, only that some such point will be. The second fundamental theorem states that given further restrictions, any Pareto efficient outcome can be supported as a competitive market equilibrium. These restrictions are stronger than for the first fundamental theorem, with convexity of preferences and production functions a sufficient but not necessary condition. A direct consequence of the second theorem is that a benevolent social planner could use a system of lump sum transfers to ensure that the "best" Pareto efficient allocation was supported as a competitive equilibrium for some set of prices. More generally, it suggests that redistribution should, if possible, be achieved without affecting prices (which should continue to reflect relative scarcity), thus ensuring that the final (post-trade) result is efficient. Put into practice, such a policy might resemble predistribution. Because of welfare economics' close ties to social choice theory, Arrow's impossibility theorem is sometimes listed as a third fundamental theorem. Utility functions can be derived from the points on a contract curve. Numerous utility functions can be derived, one for each point on the production possibility frontier (PQ in the diagram above). A social utility frontier (also called a grand utility frontier) can be obtained from the outer envelope of all these utility functions. Each point on a social utility frontier represents an efficient allocation of an economy's resources; that is, it is a Pareto optimum in factor allocation, in production, in consumption, and in the interaction of production and consumption (supply and demand). In the diagram below, the curve MN is a social utility frontier. Point D corresponds with point C from the earlier diagram. Point D is on the social utility frontier because the marginal rate of substitution at point C is equal to the marginal rate of transformation at point A. Point E corresponds with point B in the previous diagram, and lies inside the social utility frontier (indicating inefficiency) because the MRS at point C is not equal to the MRT at point A. Although all the points on the grand social utility frontier are Pareto efficient, only one point identifies where social welfare is maximized. Such point is called "the point of bliss". This point is Z where the social utility frontier MN is tangent to the highest possible social indifference curve labelled SI. Some, such as economists in the tradition of the Austrian School, doubt whether a cardinal utility function, or cardinal social welfare function, is of any value. The reason given is that it is difficult to aggregate the utilities of various people that have differing marginal utility of money, such as the wealthy and the poor. Also, the economists of the Austrian School question the relevance of pareto optimal allocation considering situations where the framework of means and ends is not perfectly known, since neoclassical theory always assumes that the ends-means framework is perfectly defined. Some even question the value of ordinal utility functions. They have proposed other means of measuring well-being as an alternative to price indices, "willingness to pay" functions, and other price oriented measures. These price based measures are seen as promoting consumerism and productivism by many. It should be noted that it is possible to do welfare economics without the use of prices, however this is not always done. Value assumptions explicit in the social welfare function used and implicit in the efficiency criterion chosen tend to make welfare economics a normative and perhaps subjective field. This can make it controversial. However, perhaps most significant of all are concerns about the limits of a utilitarian approach to welfare economics. According to this line of argument utility is not the only thing that matters and so a comprehensive approach to welfare economics should include other factors. The capabilities approach is an attempt to construct a more comprehensive approach to welfare economics, one in which an individual's well-being and agency are evaluated in terms of their capabilities and functionings. ↑ Sen, Amartya (2001). Development as Freedom. Oxford New York: Oxford University Press. ISBN 9780192893307. Arrow, Kenneth J. (1951, 2nd ed., 1963). Social Choice and Individual Values, Yale University Press, New Haven. Arrow, Kenneth J., and Gérard Debreu ed., 2002. Landmark Papers in General Equilibrium Theory, Social Choice and Welfare. Edward Elgar Publishing, ISBN 978-1-84064-569-9. Description and table of contents. Atkinson, Anthony B. (1975). The Economics of Inequality, Oxford University Press, London. Atkinson, Anthony B. (2012). Optimum population, welfare economics, and inequality, Oxford University Press, London. Bator, Francis M. (1957). "The Simple Analytics of Welfare Maximization", American Economic Review, 47(1), p p. 22-59. Calsamiglia, Xavier, and Alan Kirman (1993). "A Unique Informationally Efficient and Decentralized Mechanism with Fair Outcomes", Econometrica, 61(5), p p. 1147–1172. Chipman, John S., and James C. Moore (1978). "The New Welfare Economics 1939–1974," International Economic Review, 19(3), p p. 547–584. Mishan, E. J. (1980). "The New Welfare Economics: An Alternative View", International Economic Review, 21(3), p p. 691-705. Feldman, Allan M. (1987). "equity," The New Palgrave: A Dictionary of Economics, v. 2, pp. 183–184. Feldman, Allan M., and Roberto Serrano,  2006. Welfare Economics and Social Choice Theory, 2nd ed. ISBN 0-387-29367-1, ISBN 978-0-387-29367-7 Arrow-searchable chapter previews. Graaff, Johannes de Villiers, (1957; rev. ed., 1968). Theoretical Welfare Economics, ISBN 978-0-521-09446-7 Cambridge, UK: Cambridge University Press. Harberger, Arnold C. (1971) "Three Basic Postulates for Applied Welfare Economics: An Interpretive Essay", Journal of Economic Literature, 9(3), p p. 785–797. Just, Richard et al. (2004), The Welfare Economics of Public Policy, Edward Elgar Publishing, Cheltenham and Northampton. Kuenne, Robert E., ed. (2000), Readings in Social Welfare: Theory and Policy, Wiley. Description and scroll to chapter-preview links. Little, I. M. D. (1950; 2002). A Critique of Welfare Economics, Oxford. Preview. ISBN 0-19-828119-6. Ng, Yew-Kwang (1979; rev. ed., 1983). Welfare economics. London: Macmillan. O'Connell, John F. (1982) Welfare Economic Theory, Auburn House Publishing, Boston. Samuelson, Paul A. (1947, Enlarged ed. 1983). "Welfare Economics", Foundations of Economic Analysis, Harvard University Press, Cambridge, MA, ch. VIII, pp. 203–253. _____ (1977). "Reaffirming the Existence of 'Reasonable' Bergson-Samuelson Social Welfare Functions," Economica, N.S., 44(173), p p. 81–88. Reprinted in (1986) The Collected Scientific Papers of Paul A. Samuelson, pp. 47–54. _____ (1981). "Bergsonian Welfare Economics", in S. Rosefielde (ed. ), Economic Welfare and the Economics of Soviet Socialism: Essays in Honor of Abram Bergson, Cambridge University Press, Cambridge, pp. 223–266. Reprinted in (1986) The Collected Scientific Papers of Paul A. Samuelson, pp. 3 –46. Sen, Amartya K. (1963). "Distribution, Transitivity and Little's Welfare Criteria", Economic Journal, 73(292), p. 771–78. _____ (1982). Choice, Welfare and Measurement, MIT Press. Description and scroll to chapter-preview links. Suzumura, Kotaro (1980). "On Distributional Value Judgments and Piecemeal Welfare Criteria," Economica, 47(186), p p. 125–139.